Magic Chef -- stencil logo. 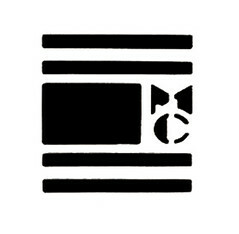 A logo for the Magic Chef brand using the initials in stencil with horizontal bars of black. This logo gives a rather different impression of the product than the script version. The stencil logo seems to draw upon military graphics and industrial products. The logo seems to take on a form reminiscent of the American flag with its alternating dark and light stripes and solid field. It seems likely that this logo was developed during WWII in response to the focus on patriotism and collective production for the good of the war effort. This logo appeared on Magic Chef stoves during the mid-1930s. That's interesting that it was developed in the 1930s. I should investigate the rise in popularity of stencil fonts. Perhaps it began earlier than I imagined.